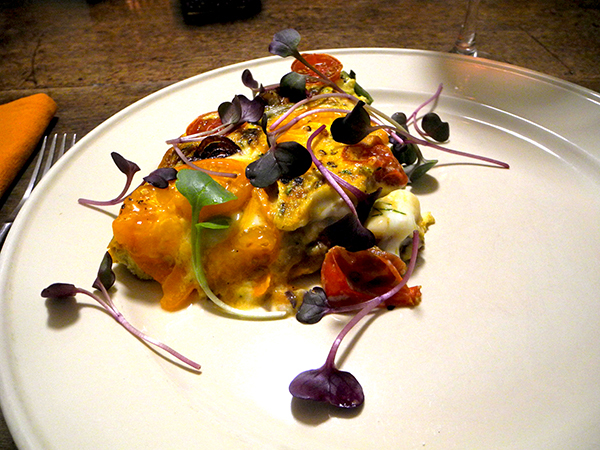 I had decided to assemble a frittata. I already had on hand just about anything I might want for it; as usual, the only question was which ingredients to include – and which to leave out. 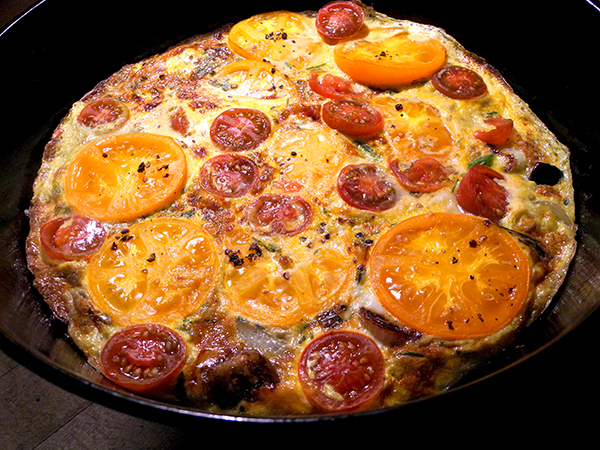 Although it’s pretty difficult to mess up a frittata, it seems I really made the right calls this time. It was terrific. 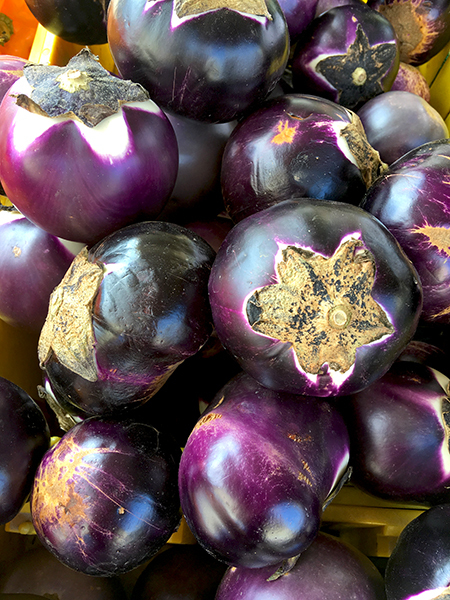 I could point to the wonderful eggplant, but then how could I ignore the other first-class ingredients, the juicy garlic, the anaheim peppers, the two different kinds of perfectly-ripooe heirloom tomatoes, the sweet onions, and of course the eggs, the herbs, and the micro greens? I just assembled the thing. This is what it looked like when it was removed from the broiler. 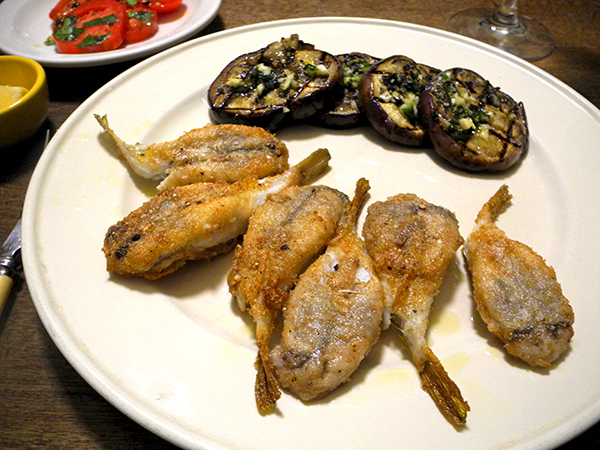 For some reason I can no longer remember, I had persuaded myself long ago that I had no interest in blowfish. In any event, after last night’s meal, that’s changed. I had seen recently on Twitter that these little guys were back in town (thanks to our hard-working Long Island fishermen and the Union Square Greenmarket). Thinking it was probably timer to give them another chance, I looked for a simple recipe. 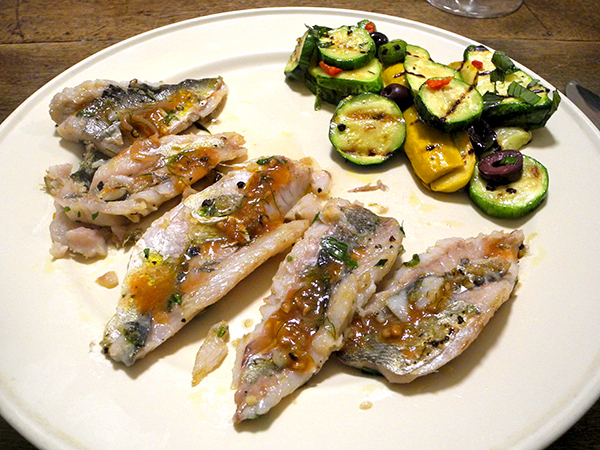 I found it, and I think it would probably be a mistake to stray far from its austerity, the fish itself is so tasty. Blowfish is a bit like fried perch, and, since I grew up in the midwest, I’ve had a lot of fried perch (even caught some), and I also miss it a lot. 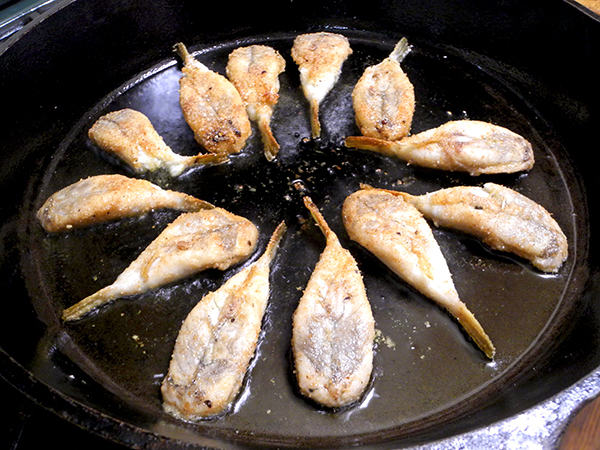 The texture is like perch as well, especially when lightly batter-fried. Where it differs most from [Perca flavescens] is in its reputation for danger (undeserved, at least as respects fish caught in our waters). There’s also the popular enthusiasm about consuming it as finger food, probably because of their size and shape, and the absence of any substantive bone but the spine (we passed on the finger thing). 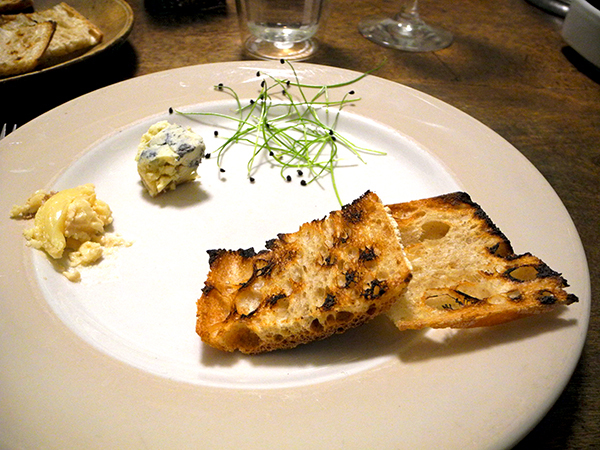 We used forks and fish knives (less messy, and for a leisurely pace much more suitable for enjoying the wine). 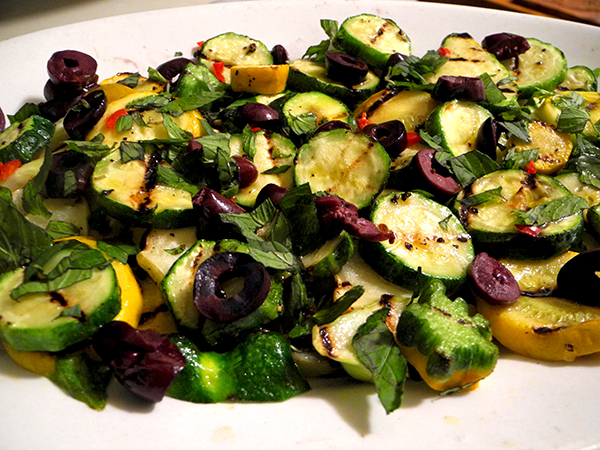 2 Sicilian (heirloom) eggplants, from Phillips Farm, sliced into 1/2-inch rounds, brushed with olive oil, pan-grilled, turning 3 times, removed to a platter, brushed with a mixture of olive oil, finely-chopped garlic from Berried Treasures, chopped marjoram from Stokes Farm, lemon zest, and pepper, drizzled with a little olive oil and kept at room temperature, for a short while while the fish was fried. two small ripe red heirloom tomatoes from Lani’s Farm, sliced, mixed with a very good Campania olive oil, a bit of salt and pepper, and torn New York City basil from Gotham Greens via Whole Foods, served in bowls on the side of the entrée. There was a small cheese course, and it gave me the opportunity to pull out my other favorite toaster, the trusty ‘Camp-A-Toaster‘, to get maximum crustiness from some odd slices of bread. 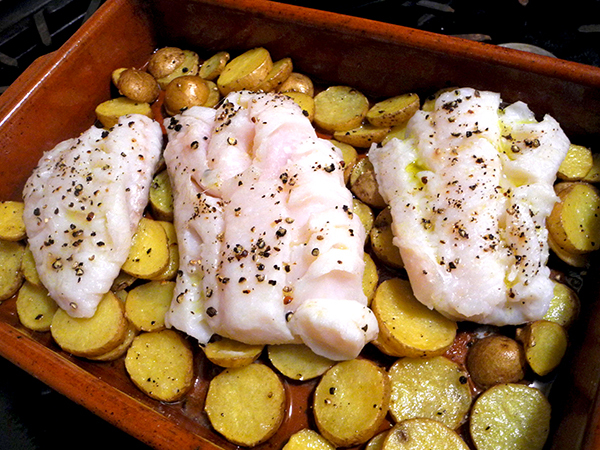 Comfort food: plain fish and potatoes. Cod, to be specific; salted cod, but not ‘salt cod‘. And Carola, to continue with specifics; originated in Germany, even better than Yukon. I know there are absolutely no cod on the shores of Liguria, so the name of this recipe, ‘Ligurian Cod’, isn’t authentic, but the taste sure is. The recipe is called ‘Ligurian fish and potatoes‘, although its author appears to have been pretty casual about the origin of the fish varieties he suggests; I assume it’s about availability this far from the Mediterranean. It’s Mark Bittman’s recipe (or at least the one that appears in his 2004 article in the New York Times is my source), but I’ve been using it for so long I think of it as an adopted child. This is another of those meals that we usually have to wait for cool weather to enjoy, because there’s definitely an oven involved. It’s a wonderful dish, and very easy to put together. 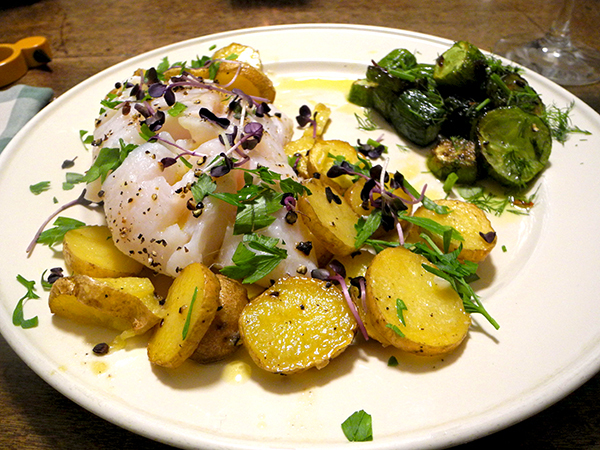 The picture above was taken just before the cod was placed in the oven. 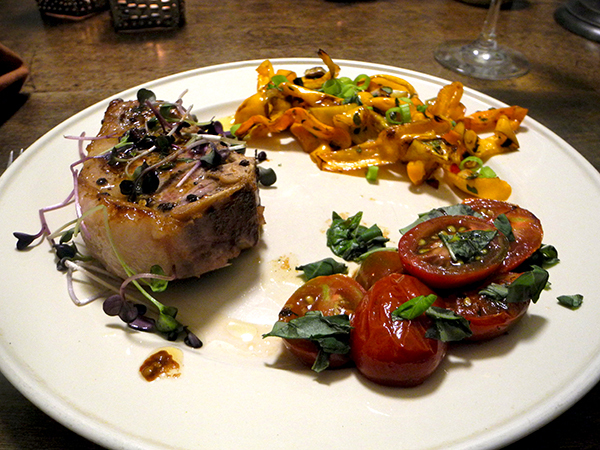 It was cool that night, so I had no hesitation in firing up the oven to cook some lemon pork chops. 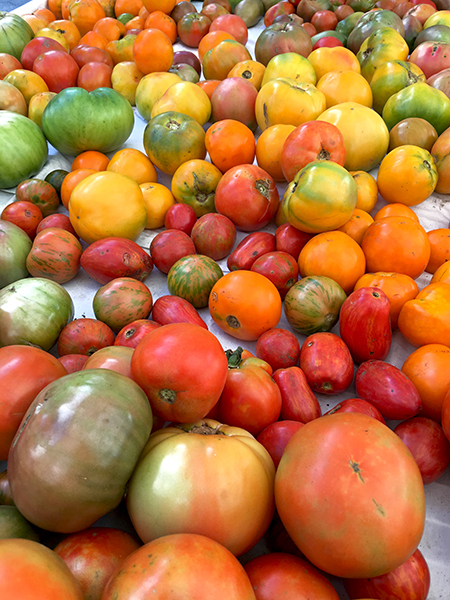 The recipe is a favorite, normally enjoyed only in cool weather, and we’ve enjoyed these dark red (‘black’) cherry tomatoes before, but this variety of sweet peppers was new to me. 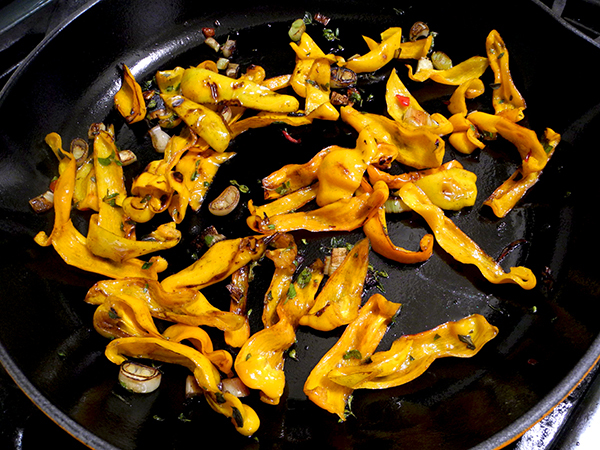 The peppers were Juicy, sweet, with a distinctive taste, and an oddly chewy texture – not at all unpleasant. I’m thinking they look surprisingly like egg noodles in the picture above, as they did on the table. For more clarification I thought I’d add an image of what they looked like as they finished cooking, but here they may look even more like noodles, maybe Spätzle. The weakfish is a noble fish, but it is not a trout. It’s generally marketed as ‘ocean trout’, since ‘weakfish’ apparently projects a less-than-positive image to potential consumers. The ‘weak’ part is actually only the fish’s jaw, which tears apart easily when it is hooked (ouch), meaning it can easily escape from an angler. I spent 20 years in Rhode Island, around waters where it was a familiar catch, and the Narragansetts‘ name for the species, ‘Squeteague‘, sounds right to me. It’s delicious whatever you call it.